Jimmy Ryan is the host of this week's Guest Mix! Boston's Jimmy Ryan - who has recorded and performed with Morphine to the Blood Oranges, his own solo projects, and countless other area bands over the years - is this week's host of Guest Mix on WUMB! Tune in as he chooses the songs for an hour, and tells the stories behind his choices. Guest Mix airs every Saturday at 1 PM. Tune in to 91.9 FM in the Boston area or listen online. LORETTA LYNN IS ARTIST OF THE WEEK! Country music icon, Loretta Lynn, turned 87 on Sunday 4/14! All week, several times per day, WUMB will celebrate Loretta's legacy with her own songs from decades on stage and in studio, collaborations, covers, and more!! Check out WUMB's Audio Archives! WUMB records every in-studio performance that graces our airwaves, and we archive them on our website. There are ~100 recordings dating back over a decade from artists like Steve Earle, Lake Street Dive and Kim Richey! Anyone can enjoy the most recent uploads, but we reserve the vast majority of the archive for our Members. Another perk of WUMB Membership! Click HERE to access the WUMB Audio Archives. 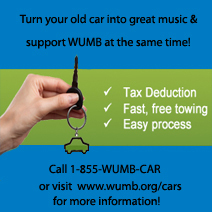 Stream or download to listen at your convenience, and thanks for supporting WUMB!